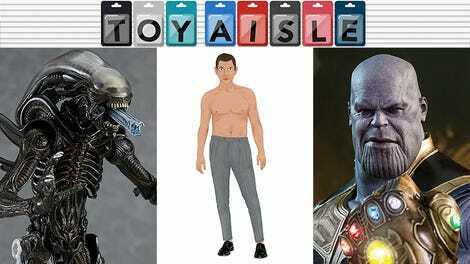 Welcome back to Toy Aisle, io9's weekly roundup of the neatest toys around. 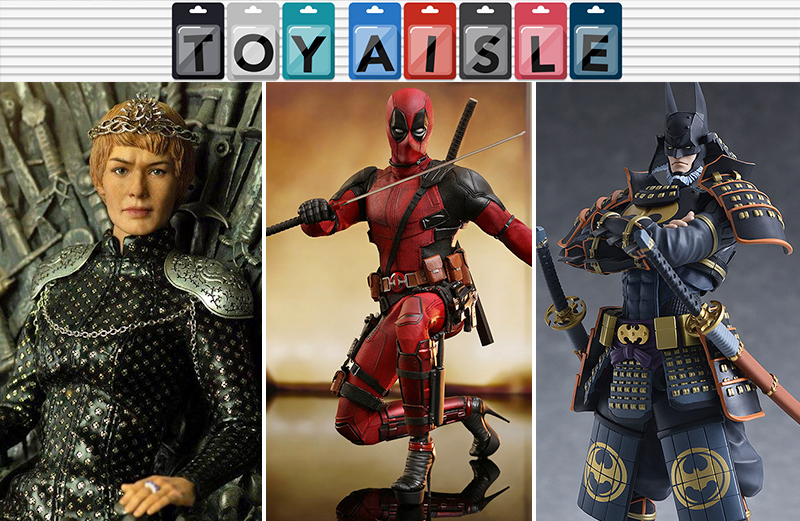 This week, Hot Toys gives us a Deadpool with killer footwear, the incredible Batman Ninja gets an equally worthy action figure, and more Harry Potter Lego than you can shake a whomping willow at. Check it out! As with the original sixth-scale action figure version of Deadpool that Hot Toys released for the first film, the toymaker’s Deadpool 2 follow-up comes with a bunch of irreverent accessories. For $250 you get a head with five swappable eye pieces to change the character’s expression, 12 different gloved hands for striking the perfect pose, and a pair of black high-heeled shoes if you want to recreate Deadpool’s epic music video with Celine Dion. Does this mean a Hot Toys Celine figure is en route too? Despite there being no Harry Potter movies on the horizon starring the old gang, Lego has decided to fill the Harry, Hermione, and Ron void with a bunch of new sets. Following up on the new Harry Potter BrickHeadz comes three additional sets including the 500-piece, $40 Quidditch Match; the 801-piece, $80 Hogwarts Express; and the 753-piece, $70 Hogwarts Whomping Willow that can be actually connected and used to expand the Hogwarts Great Hall set revealed earlier this year. We absolutely loved Batman Ninja, and part of that was thanks to the truly wild re-imaginings of Batman, his allies, and foes’ typical comic designs by Afro Samurai’s Takashi Okazaki into Sengoku-era Japan-inspired get-ups. Now Batman’s look from the film is being turned into an excellent Figma action figure. The Deluxe edition includes bonus accessories (including a posable cloth cape) to switch Batman between his “Sengoku Batman” and “Batman Ninja” looks from the movie, as well as a host of weapons and other accessories to style this radically different redesign of the Dark Knight in a plethora of poses. If you don’t care about Harry Potter or Star Wars, Lego still has a great way for adult fans of the toy to keep collecting its building sets. The toymaker’s Architecture series has been slowly rebuilding the world’s most famous landmarks, brick by brick, including, now, the Statue of Liberty. The 1,685-piece, $120 set will be available nationwide starting on June 1 (or as early as May 19 if you’re in New York) and includes Lady Liberty’s golden torch—which actually appears to be a repurposed minifigure hairpiece. Next to lightsabers and R2-D2, Han Solo’s blaster is one of the most sought-after props from the Star Wars films. If you’ve got the time, patience, and talent, you can build your own replica. Or, for $30, you can grab this Han Solo Nerf blaster that has authentic sound effects and fires glowing darts designed to simulate blaster fire in the dark. It’s not a perfect recreation, but with a little paint and elbow grease, you can probably get it to look like a smuggler’s sidekick. Lego’s Ultimate Collectors Series Millennium Falcon isn’t just a toy—at $800, it’s an investment and one that you’ll probably want to put on display once it’s built. It’s one of the most accurate sets Lego has ever produced, but there’s now a way to make it even more impressive. A small company called BrickStuff has created an elaborate light and sound kit for the UCS Falcon that brings the ship to life, even just sitting on your desk. Blasters flash, the warp engine lights, and there’s even an option for a glowing, spinning hyperdrive. The fully-loaded kit will set you back $411, though, half the cost of the Lego model itself. Suddenly smuggling sounds like a good way to quickly raise some cash. ThreeZero’s line of Game of Thrones figures finally makes its way to the messiest drama Queen in all of Westeros, the sinister Cersei Lannister. Based on her royal regalia from the seventh season, the 11" tall figure is sparsely accessorized, only coming with a pair of relaxed and err, slightly more relaxed hands, as well as her minimalist crown. At least give her a goblet of wine or something! But still, this is one of Cersei’s most fabulous looks, so it’s nice to see it getting the action figure love. If you want one, it’ll set you back $178 when preorders go live on May 23.